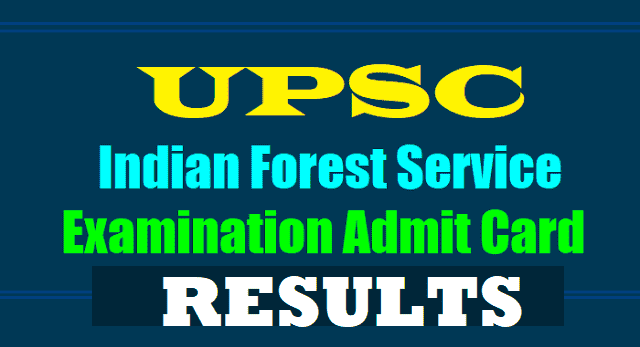 UPSC Indian Forest Service Main Examination Admit Card 2017 Download at upsconline.nic.in/ UPSC Indian Forest Service Main Exam 2017 E-admit card released at upsc.gov.in. Union Public Service Commission (UPSC) has released the e-admit card for Indian Forest Service Main Examination, 2017. The e-admit card is available for download on the official UPSC website. The admit cards will be available for download till December 3, 2017. The Main examination for Indian Forest Services 2017 will begin from December 3, 2017 and will be conducted in two sessions. The last date for Main examination is December 13, 2017. The detailed time table is available on the UPSC website and can be downloaded from there. UPSC IFS Main Exam 2017 Result released at upsc.gov.in, Fill DAF from 10th January 2018: UPSC IFS Main Examination 2017 Result has been declared by the Union Public Service Commission (UPSC) on its official website – upsc.gov.in. UPSC had conducted the Indian Forest Services Main Examination 2017 in December last month and candidates who have qualified the exam will now be eligible to appear in the Interview or Personality Test round. How to Check UPSC IFS Main Examination 2017 Result? The Commission will make e-summon letters available on the website for qualified candidates and no summon letters will be sent by paper. However, qualified candidates who would not receive any communication on the same by UPSC, must contact the Commission’s office on the following numbers - 011-23385271, 011-23381125 & 011-23098543. The Interviews or Personality Tests of the qualified candidates will be organized at the Office of Union Public Service Commission at Dholpur House, Shahjahan Road, New Delhi-110069. Also, the qualified candidates are required to fill the DAF to submit Cadre preferences from 10th January 2018 on UPSC’s official website. Step two: Click on the admit card link in the What's new section of the website. Step three: In the new window, you will have to click on the admit card link again. Step four: You will first be taken to the instruction page. Read the instructions issued for candidates carefully and if need be take a printout too. Step five: Click on 'yes' to indicate that you have read the instructions. Step six: Select one of the two options given - by Registration number or by Roll number. Step seven: Enter your roll number/registration number, date of birth and random image given. Step eight: Submit the information and your admit card will be displayed. Take a printout. Log on to the official website www.upsc.gov.in. Under 'What's new', click on 'e-Admit cards: Indian Forest Service (Mains) 2017'. In the provided fields, enter your registration number/roll number, date of birth and image code. Click on submit. Your admit card will be displayed on the screen. Download the same and take a printout for future reference. 1. The Indian Forest Services (Main) Examination, 2017 will be held in two sessions and each session will have three hours plus twenty minutes per hour (total sixty minutes) compensatory time for Visually Impaired candidates (visual impairment 40% or more). Such candidates will accordingly be allowed three hours and sixty minutes to answer in each session. Important Instructions 1. Check the e-Admit Card carefully and bring discrepancies, if any, to the notice of UPSC immediately. About UPSC: It is India's central agency authorised to conduct the Civil Services Examination, Engineering Services Examination, Combined Medical Services Examination, Combined Defence Services Examination, National Defence Academy Examination, Naval Academy Examination and other important government exams.